Think decide and then explore. This quote is simply not found in the Buddhist scriptures, and the wording is totally unlike the kind of thing the Buddha is recorded as having said. Sorry to disappoint, but it’s just not a quote from the Buddha. Thank you for telling us the truth that “The whole secret of existence is to have no fear” is in fact a lie. 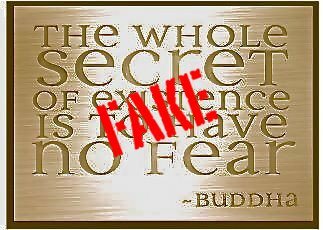 As an ordinary man I like Buddhas teachings, but I never knew that there were fake Buddha quotes in the world.